Centrally situated between Cape Town and Oudtshoorn, Montagu on the Route 62 nestles in the western corner of the Klein Karoo. Things to do: hot springs; horse riding; wine tasting; quad biking; mountain biking; rock climbing; abseiling; art galleries; 4X4 trails; brandy museum; indigenous herb museum; wild flower garden. 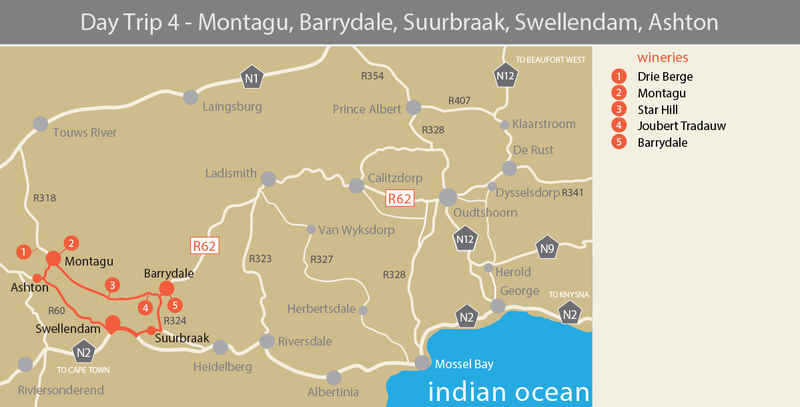 Cellars in and around town are Montagu and Drie Berge Winery. It is here that the country’s favourite dessert wine, Muscadel, is produced. Things to do: cellar tours; wine tasting. From here, travel along the R62 towards Barrydale. Next stop along the route is Star Hill Wines at the Akkerboom Farm Stall. Please stop here for wine tasting and something to eat. Further along are Joubert-Tradauw Vineyards and Cellar. Things to do: cellar tours; wine tasting; alfresco deli; Klein Karoo tapas under the vines. The Barrydale Cellar in Barrydale is one of South Africa’s top pot still brandy producers and well worth a visit. Things to do: hot springs; game reserve; quad biking; mountain biking; succulent garden; 4X4 trails; nature reserves; labyrinth; just relax. The spectacular Tradouw’s Pass leads to the historical mission town of Suurbraak. The traveler encounters this quaint town unexpectedly along the Tradouws River at the foot of the Langeberg Mountains, on route between Swellendam, Barrydale and Heidelberg. The village is well worth a visit for tourists who wish to explore. Things to do: village walks; mountain hikes; braai facilities alongside the river; bird watching; furniture making; horse riding; cart rides. Then onwards to the N2. Turn left towards Swellendam. Nestled at the foot the Langeberg Mountains, this historic heart of the Overberg will offer you experiences to remember. It has a diverse variety of activities and attraction including history, architecture, wildlife and outdoor adventure. The R60 will take you to Ashton and from there, take the R62 back to Montagu. Distances: Swellendam to Ashton (49 km). Ashton to Montagu (10 km). 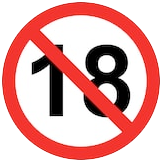 Montagu to Star Hill Wines (40 km) – Star Hill Wines to Joubert Tradauw (12 km) – Joubert Tradauw to Barrydale (11 km) – Barrydale to Suurbraak (22 km) – Suurbraak to Swellendam (20 km). Round trip is 164 km. A unique rural atmosphere distinguishes Montagu as one of the best preserved late Victorian agricultural villages in the Cape with a variety of superb accommodation and restaurants. Because of the mountains surrounding the town, Montagu is ideal for all mountain related-sport and activities. To find out more about Montagu and its surround, places to stay, where to eat or to get the contact details of the activities mentioned, please contact the Montagu-Ashton Tourism Bureau. Despite its ever growing popularity, Barrydale retains its rural, old world charm with long stretching gravel roads and open spaces. It supports a diverse, yet harmonious community of young and old, Afrikaans and English, fruit farmers and artists, long time residents and newcomers. This Karoo village is the perfect destination for visitors who wish to unwind and relax. Barrydale is situated in transitional veldt on the northern opening of the Tradouws Pass leading through the Langeberg Mountain range. The mountain range on the south of the town has fynbos vegetation, while the area north of the town is the beginning of the winter rainfall succulent Karoo. The fynbos of this area contains such species as the white sugarbush protea, Protea repens, the King protea, Protea cynaroides, the Queen protea, Protea magnifica and endemics such as Leucodendron tradouwensis, Erica tradouwensis and Erica barrydalensis. Some people just love the wide open spaces of the Klein Karoo, others appreciate the fact that they are hiking a world heritage site, still others appreciate the beauty of walking through an ecological hotspot where three plant biomes (succulent karoo, cape thicket and fynbos) converge. To find out more about Barrydale and its surround, places to stay, where to eat or to get the contact details of the activities mentioned, please contact the Barrydale Tourism Bureau.